Dwaine Caraway answered the phone Thursday afternoon. That was once unremarkable, but it is not something he does for reporters anymore. And, likely, it is not something he will be allowed to do within a matter of days. Which might be why he wanted to talk now, though he sounded tired and ill, all the bounce of his familiar baritone deflated. "Oooh, I ain't never seen so many dark days as I'm looking at now." That is how he answered. No time, I guess, for pleasantries, only facts, plain and awful facts. Because he was right. They are coming, the dark days, barreling down. 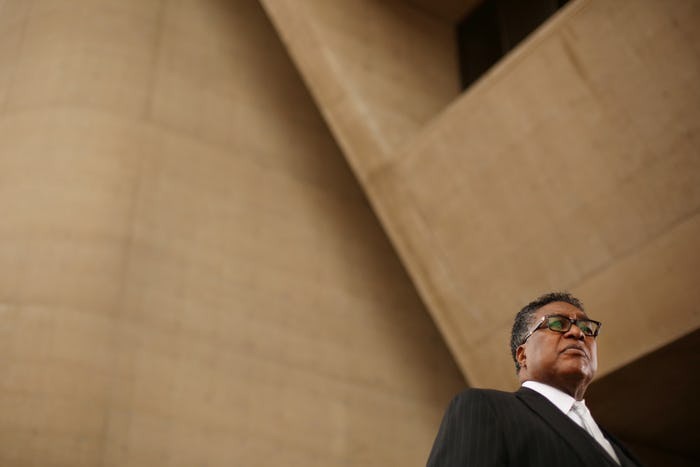 On April 5, the longtime Dallas City Council member who briefly served as this city's acting mayor will be sentenced to prison for admitting to accepting $450,000 in bribes and kickbacks from the men responsible for the downfall of Dallas County Schools. How much time he will get, Caraway and his attorney Michael Payma will not know until sometime after 1:30 p.m. on a Friday now in plain sight. "Only God knows," said the 66-year-old Oak Cliff native, who pleaded guilty in August to wire fraud and tax evasion, charges he said he never saw coming even while being interviewed by federal agents. God knows — but so, too, does U.S. District Judge Barbara M.G. Lynn, who will set his sentence, just as she did for one-time Mayor Pro Tem Don Hill in February 2010 after a jury found him guilty. Lynn punished Hill with 18 years behind bars for accepting bribes worth a fraction of a fraction of what Caraway pocketed. Hill served just seven years of that sentence before prostate cancer killed him, days after he was granted "compassionate" release from a federal prison in North Carolina. Though Caraway pleaded guilty, sparing this city the sordid spectacle of yet another corruption trial, and though he has cooperated with the feds in ways we don't yet completely know, there is good reason to believe Lynn will give him every second of the seven years to which he and federal prosecutors agreed. In February, Caraway's attorneys and federal prosecutors asked Lynn to push his sentencing, initially set for last December, to late summertime. For reasons she kept to herself, the judge later refused. Perhaps, Caraway now says with the sad shrug of inevitability, that was for the best. "I want to put things behind me and get to the point where this is a bad dream that happened," he said. "It has been the worst time in my life. I cry every day — almost crying now. I dealt with it so I ...," he paused. "It's a different type of burning feeling on the inside that's as terrible as ever. Eating at you, saying, 'You know, things were really moving right, how did I get here?' Of all people, how did I get here?" There is, of course, an easy answer to that simple question. Caraway got here by collecting and hiding hundreds of thousands of dollars from con men who wanted his help making millions using worthless stop-arm cameras affixed to school buses. He took his dirty money — "consulting fees," as if — in checks cashed at liquor stores and pawn shops, in trips to Las Vegas and New Orleans and Austin, in fancy suits and gambling chips and security cameras and loans that were never going to be paid back. According to Bob Leonard, who owned the camera company that collected tens of millions from DCS, Caraway never hid his intentions. In his own guilty plea made public the same day as Caraway's, Leonard said Caraway told him, "I am the City Council." Not since last summer. Not since he pleaded guilty to betraying the constituents who elected him, time and again, to represent a southern Dallas district desperate for the simple basics that residents of decent and whole cities should be able to take for granted. Not since he reduced his entire life's story into a single sentence. Caraway did not completely disappear from view, attending candidate forums and dispensing Thanksgiving turkeys like everything was fine. He can still be spotted dining out, and "I go out to the graveyard and talk to my dad, and let him know what's going on," Caraway said. What do you tell him, I asked. But he said most of his time has been spent looking after his 90-year-old mother, who lives down the street from her son and suffers from dementia. Caraway is her sole caretaker and said he doesn't know if she is fully aware that her boy is about to disappear for a long, long time. "So I will have to deal with that next week, after court, if I am allowed to," he said. Caraway worries, too, that he could get a long sentence, and that when he gets out, "she could be gone from here." "I haven't been asleep since August," Caraway said Thursday. "I am ashamed. I am strong and participating with the system, of course, but these are the darkest days of my life. Disappointing all of the people who were and are still praying and pulling for me. But, man, I ain't never seen it so tough." The beginning of the end came with a knock on the door around 6:30 the morning of July 10, Payma said this week in a separate interview. Federal authorities showed up at Caraway's house, near the Cedar Crest Golf Course, carrying a search warrant. The mayor pro tem had just gotten out of the shower and wore only a robe. Caraway invited them in, showed them around, told them everything. The agents, Payma said, "were polite, cordial and extremely professional." But Caraway did not call his attorney that morning or for many days afterward. He agreed instead to sit for several interviews, to cooperate. When Caraway finally did call his attorney, Payma said, "It was every lawyer's nightmare." "But I didn't know I was doing something wrong," Caraway said Thursday. If that answer shocks you, that is only because you have forgotten all the other indiscretions Caraway escaped unscathed. Like the time he got the cops to lay off his dad's favorite South Dallas poker house. Or when he went to court to bury police records related to a domestic dust-up involving his wife, some aprons and a kitchen knife. Or the countless, never-proved accusations of shakedowns. "But once it was explained to me, once it was shown to me, it's like teaching a kid how to count to 10," Caraway said. "Once you know, you say, 'You're right.' So ... I've ... I'm ... I am disappointed. But I have faith in God and faith in the system. I just made an error in judgment. It was an error in judgment, and I am paying for it, and I am sorry for it. That poison seeped under the door and right up into my nose." Caraway was born in this city. He never left this city. He expected to die here. But on April 5, it is very likely the judge will send him far away from here for the first time in his life, and for a very, very long time. "This is something that's just unreal," Caraway said before we hung up. "But it's real. This was not supposed to happen to Dwaine." But it did. Because he let it.